Beat your nightmares! For centuries, the masters of the Order of Dreamers have studied the infinite expanses of human dreams. They traveled through the rolling plains of Somnolence, surfing the unpredictable waves of Sleep. Combine fragments of monsters to create nightmare creatures. 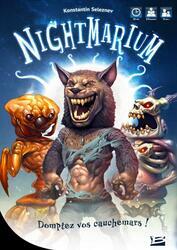 Dice the Night Terrors and scare your opponents to win the victories!